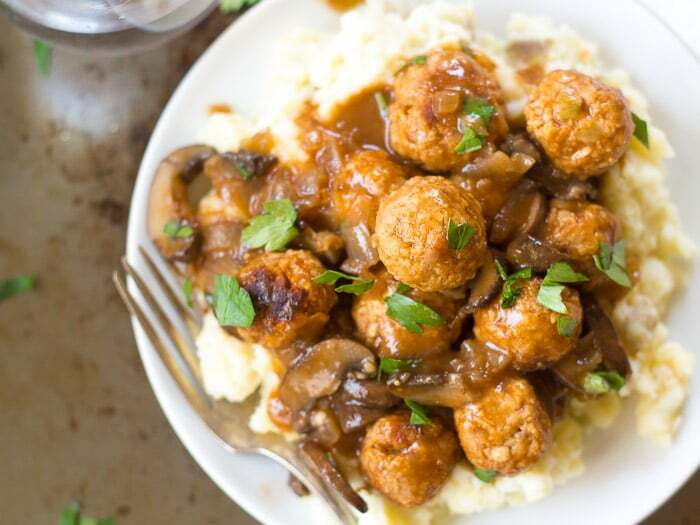 These vegan Salisbury steak meatballs are made from a savory base of chickpeas, served over mashed potatoes and smothered in mushroom gravy. A few weeks ago I needed yellow potatoes for another recipe. I only needed one or two, but my supermarket only sold giant bags of them, so that’s what I got stuck buying. To use up the rest of the potatoes, I thought mashed potatoes would be nice, and specifically, something all saucy and sloppy served over mashed potatoes. There are lots of dishes that get served over mashed potatoes, but most of them aren’t vegan, so I couldn’t think of what I wanted, and I consulted Google for recipes that get served over mashed potatoes. 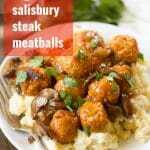 One of the first things that popped up was Salisbury steak meatballs. 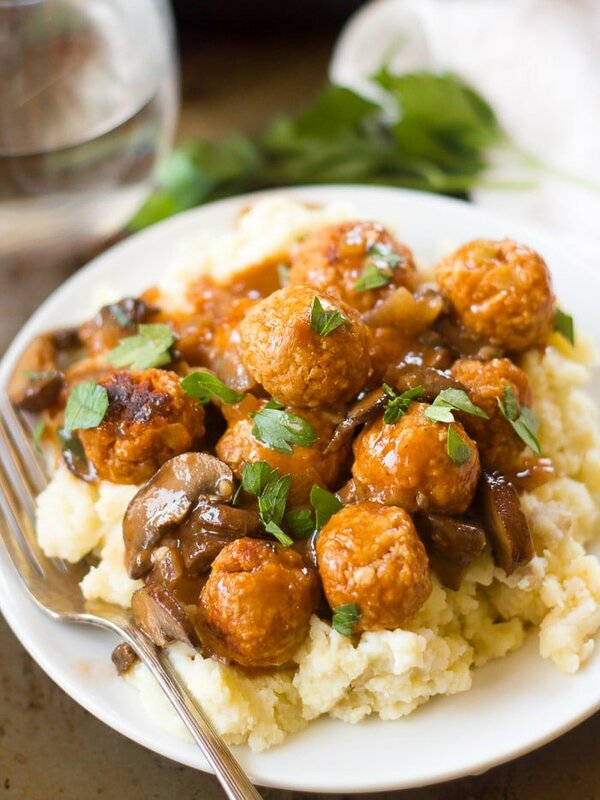 Vegan Salisbury steak meatballs? Yup! I was sold pretty quick on that one. So that’s how we ended up with this crazy dish. It actually touches on a number of other topics that I’ve been hitting hard this winter, like meatballs, gravy, and comfort food in general. These things all seem to go over pretty well with you guys, so I’m hoping you’ll be all about these meatballs. I debated what to make my meatballs out of, and since chickpeas are my answer to everything, I went with them. It’s been a while since I had any kind of Salisbury steak, so I had to call mom and ask what it tasted like. “Kind of like a meatloaf, but with gravy instead of ketchupy stuff on top,” is the answer I got from her. I’ve done chickpea meatloaf before, so I thought I could handle that. It worked out beautifully. I’m filing this one under ultimate vegan comfort food. My husband and I enjoyed it on a freezing cold night. Make ahead option: You can save time on the day of serving by making each of the components of this recipe in advance, and then reheating. The gravy might thicken up during storage — just thin it with some water when you reheat it! Try to keep the mushrooms in an even layer when you cook them (cook in batches if needed), and don’t stir them around. Just flip them halfway through cooking. Piling mushrooms up in the skillet and stirring them around too much will prevent browning. For those people that hate mushrooms: just leave them out! you can also cut the amount of oil used to make the gravy to 1 tablespoon, since you don’t need to sauté the mushrooms. Switch things up by serving this over something other than mashed potatoes, like rice, cauliflower rice, or noodles! To make the vegan Salisbury steak meatballs, preheat the oven to 400°. Place all ingredients into the bowl of a food processor and pulse until well chopped and combined, being careful not to overdo it. Lightly oil a baking sheet or large oven-safe skillet, then roll the chickpea mixture into 1 inch balls (you should get about 30) and arrange on the baking sheet. Lightly brush or spray the balls with oil. Bake until lightly browned, flipping half way through, about 30 minutes total. While the meatballs bake, make the mashed potatoes. Bring a large pot of water to a boil and add the potatoes. Cook until tender and easily pierced with a fork, about 20 minutes. Return the potatoes to the pot and mash with potato masher. Stir in the milk and garlic. You can add a bit more milk if you'd like a creamier texture. Season with salt and pepper to taste. While the meatballs bake and the potatoes boil, make the gravy. Coat the bottom of a large skillet with 2 tablespoons of olive oil and place it over medium heat. Add the mushrooms and allow to cook for about 5 minutes, then flip and cook 5 minutes more, until browned on both sides. Transfer to a plate. Add remaining tablespoon of olive oil to the skillet. Once hot, add the onion. Sauté for about 5 minutes, until translucent. Return the mushrooms to the skillet and sprinkle in the flour, flipping to coat the mushrooms. Pour in the broth, stirring constantly, then add the tomato paste and soy sauce. Raise heat and bring to a simmer. Lower heat and allow to simmer for about 10 minutes, until it thickens up to a nice gravy consistency. Season with salt and pepper to taste. Add the meatballs to the gravy and stir a few times to coat with the gravy. To serve, divide the mashed potatoes onto plates. Top with meatballs and gravy. Sprinkle with parsley. Serve. 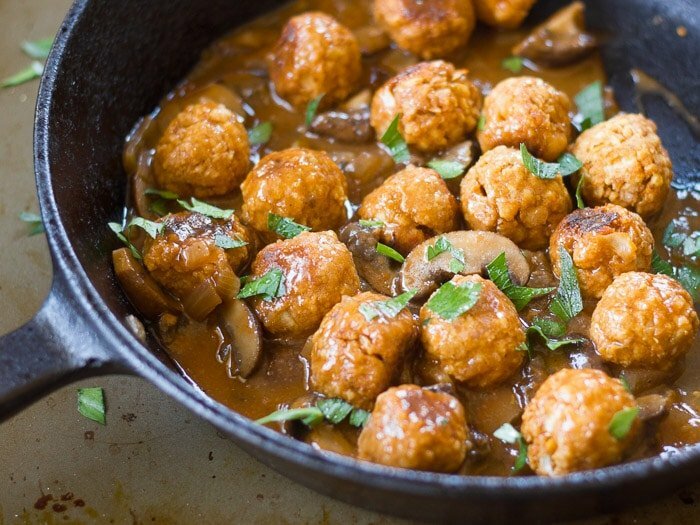 These vegan meatballs look so hearty and delicious! I love all of the savory components you used in the recipe… talk about umami! This was really delicious! My only change would have been less garlic in the potatoes, but it may be because I didn’t have quite as many potatoes (had to throw a sweet one in!). I was super-delighted with the yumminess of this dish. Thank you! Definitely scratched an itch for me. Linking my cooking blog, but alas, I haven’t added much since going vegan in Jan. 16. These meatless balls are the best tasting vegan balls I’ve tried making! So full of flavor from the tamari, mustard, vegan Worcestershire sauce and red wine vinegar (I didn’t add liquid smoke). I did have an issue with their dry consistency in the food processor, so I added 2 tbsp grapeseed oil and 3 tbsp warm water to get the right consistency for scooping into balls. I think next time I won’t drain the chickpeas and perhaps the liquid will provide the needed moisture. I used a Silpat mat without adding any additional oil and the meatless balls turned out perfect. Thank you for a great recipe! Thanks Mary! I’m so glad you enjoyed them!! When you say whole grain mustard, is that dried or prepared? What can I use instead of red wine vinegar? Would balsamic be too overpowering? I think balsamic would change the taste quite a bit. Plain white vinegar or apple cider vinegar might work though. Wow! These were really good! I found this for the same reason as you – I had bought red potatoes last week but they only came in a 5lb bag. I still had over half left so I was looking for a mashed potatoes recipe. Much easier to make than some other veg meatballs I’ve tried, probably because the food processor did all of the work. Yay! Glad you found the recipe and enjoyed it! Thanks Megan! I made this tonight and it was incredible. I am so glad I stumbled upon your sponsored ad and look forward to making more of your recipes soon. It is hard to top the savoriness of this dish :) I also think you could save the ‘meatballs’ for other uses, like sandwiches. Yum! I’m glad you enjoyed this! And I totally agree – the meatballs would be great in all kinds of dishes! Wow….this recipe looks really yummy. Any suggestions for another gravy? I don’t eat mushrooms. Thanks! GOing to try this fabulous looking dish but cutting out most of the oil, sautéing in broth. Have been looking for a dish just like this. I’m going to use organic russets because I found 5-lb bags for $2.50! Really cheap for organic. Thank you for a great meatball recipe. I assume you could serve these with a traditional pasta sauce or marinara too? You might want to play around with the seasonings a bit, but absolutely! I’d probably skip the Worcestershire sauce and add some garlic and Italian seasoning instead. I hope you enjoy!! These are the most fabulous, satisfying “meatballs” ever! They remind me of a seitan cutlet I used to make, but healthier without the vital wheat gluten. Plus the gravy is amazing! Even though they are meant as a salisbury steak, I could see them as a meatball sub with marinara sauce. They are truly genius. THANK YOU! Yay!! I’m so glad to hear that! Thanks Ellen!! Can someone pleaseeeeee describe the texture i am looking for a meaty texture-not too mushy. I’m glad you enjoyed them! I’d recommend cutting back on the soy sauce, or using a low sodium variety. You can also look for low sodium chickpeas or cook up some dried chickpeas, as canned tend to have lots of salt added. I made these meatballs and your marinara sauce and served it with pasta. All I can say is FREAKING DELICIOUS!!!!! Thank you for such amazing recipes!!! Is there any substitute for the liquid smoke? It seems impossible to come by where I live here in Germany, and I just don’t have the patience to wait until it arrives from Amazon. I am obsessed with your blog. My entire last week’s meal plan consists of recipes from it. Thanks! Oat flour might work! 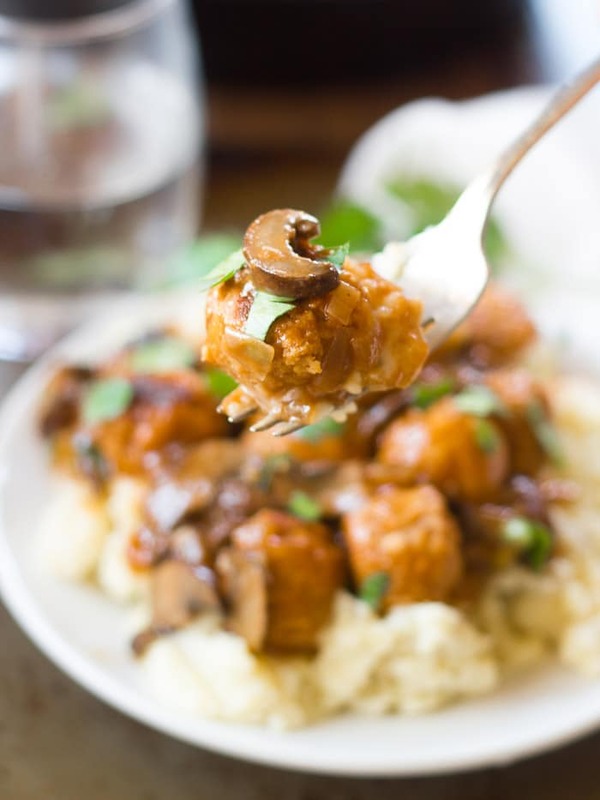 This mushroom gravy is amazing and has become one of my faves!! I’m so glad to hear that!! Thanks Susan! What should I cut back on if I was going to double this so it’s not too salty? I’d cut back on the soy sauce or use low sodium. Thank you Alissa for this excellent recipe! So delicious. I really liked the meatballs. Such great flavor. The only change I made was Herbs de Provence in the gravy. BTW your recipes always catch my eye. Thanks for your amazing work. Aloha from Maui! I’m so glad you enjoyed these! And Hebs de Provence sounds like a delicious addition to the gravy. :) THanks Ashley! These sound so awesome! I’m always looking for recipes like this since becoming Orthodox because of our many fast days. Since I’m soy intolerant this kind of “meat” is really a wonderful idea. I’m thinking you could also make it into patties….although meatball sandwiches sound excellent too (there are only two of us, so bound to be leftovers). I was planning on making these for Thanksgiving … in efforts to best use my time do you think I could make the meatballs and them refrigerate them until I was later to bake cook them in the evening? Thanks!! I think that should work just fine! I hope you enjoy them! We had these earlier for a birthday meal and loved them! I’m thinking about making them again for Christmas. Would it work to make the meatballs ahead of time and freeze them? Thank you! I’m glad you enjoyed them!! You can make them ahead and freeze them! I actually like to make the chickpea mixture for the meatballs and freeze that. Then when I’m ready to serve it I thaw, roll and bake. But if you want to do everything ahead of time and freeze them that will work too! Love this recipe! I made it exactly as written and it was delicious. Best neatballs ever!! Each mouthful has such a flavor punch and with the addition of the panko and onion it has texture! Not mushy. Yum! Last night I made patties out of the mixture and we had veggie burgers. Perfect with a bun and all of the fixings. Thank you for creating such an awesome recipe. Oh YUM!! 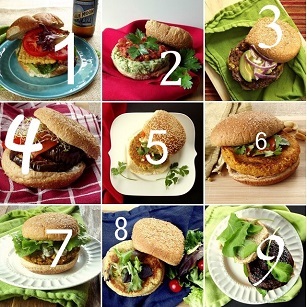 Now I want to try this as burgers! Thanks for the idea, and I’m so glad you enjoyed this! Sorry to hear that! You’re correct that the oil is for the pan. There is some variation in consistency among different brands of chickpeas, so maybe yours were particularly dense or dry? If that’s the case I’d add a splash of water or non-dairy milk. I made this yesterday-IT IS FANTASTIC!!! I used to love Salisbury steak TV dinners as a kid. Everyone liked except my picky teen boy, even my MIL who is pretty picky ate it. (usually she’ll take a bite of something and say “I’m full” or sneak it to the dogs.) This will go in my repertoire of recipes in regular rotation. Thanks. Yay!! I’m glad it was a hit! Thanks Marie! I was nervous about this recipe when I tasted the meatballs out of the oven, but each element of the recipes complements the others perfectly! So good! I’m so glad you enjoyed it!! Thanks Julianne! I made thieve to accompany my family’s thanksgiving dinner last night. They were easy and delicious! Thank you for the great recipe, it is the perfect dish for a rainy fall day. Yay!! I’m so glad you enjoyed them! Thanks Marina! I’m planning to make this recipe tomorrow and I’m wondering if I could substitute the chickpeas with canned fava beans. What do you think? I think that would work, but can’t say for certain as I haven’t tried it myself. I’d love to hear how it turns out if you try it!